By the Switlik Parachute Company of Trenton, New Jersey. 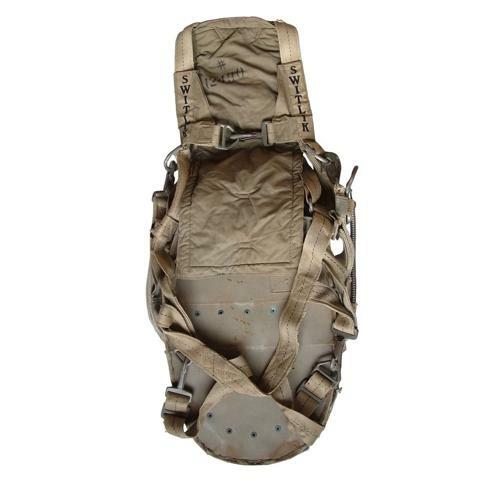 Comprises a Group 1, Army Air Forces type QAC (quick attachable chest) type harness produced in white webbing with a central black fleck. Fitted with the early style 'dog-lead' clips. No red colour coded patches on the riser straps suggesting early production. No markings other than the 'Switlik' panels at the front. With correct olive drab cotton backpad having faint markings (manufactured in Turner Falls). The harness is in good '+' condition, damage free but a bit grubby. Minor corrosion can be seen on the cadmium plate metal components. Comes with a Switlik 'Safety Chute' back pack/canopy, possibly produced for the civilian market. This large oval shaped pack (approximately 59 x 38cm) is complete with partial webbing harness enabling it to be attached to the rings on the front of the QAC harness whilst being positioned on the wearer's back. A ripcord housing is linked to the left webbing strap. When deployed, the ripcord releases the pack cover which is integral with the canopy and acts as a drogue. The pack is faded and has minor fraying but is in good condition complete with ripcord, handle and canopy. It is well marked and has a clear 1943 date. We have not removed the canopy to look for markings but it would appear to be original to the pack. A great harness with an unusual and rare pack. Stock code S22831.